After moving the 5 notifications I prefer into the top active row, the panel resets itself to the default spontaneously (usually within 5-10 minutes). 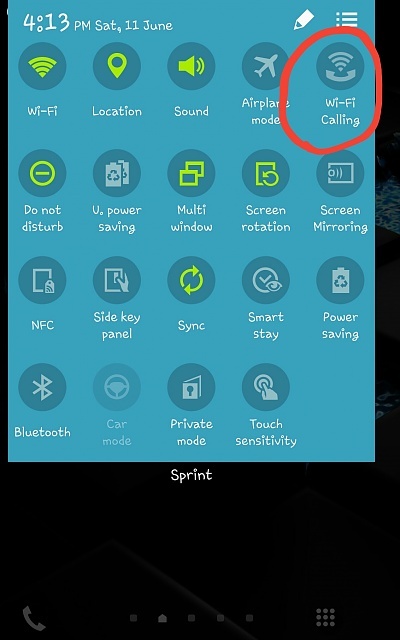 I prefer to add Airplane Mode and Do Not Disturb to the top 5 rows, but again my Sprint Note Edge keeps resetting to default.... Frustrating but not a major problem. I cleared the cache partition several times. Anyone else having this issue? UPDATE: One of the panels that kept positioning itself was WiFi Calling. So I decided to manually reset the Notification Panels to default and noticed that WiFi Calling was no longer present. So something I added/updated recently must have added Wifi Calling, and it kept forcing its way into the top 5. After resetting I manually moved my preferred Notification Panels to the top 5. It's been an hour and no problems. I will update if the problem re-occurs!! The Wifi Calling icon reappeared and positioned itself in the top row of 5 again???? Me too, and still so. Did you ever find a solution??? Me too. There back again today. Someone please shed some light on this. How do in fix the pop up that Google play services has stopped, it keeps recurring. how to download and install Android 5.1.1 lollipop for moto g2 2014 xt1069? Samsung A7 has a black screen (not after a fall) and seems to function, but i can't see it. can i disable the brightness slider on the notification bar with root?